(Nanowerk News) The Wip1 protein is important for survival, but mutations that inactivate it carry some surprising features. “A lack of Wip1 results in an excessive immune reaction to infectious organisms, in some cases killing the host,” explains Dmitry Bulavin of the A*STAR Institute of Molecular and Cell Biology, Singapore. He also notes, however, that mice lacking Wip1 are considerably less prone to certain cancers. Now, research from Bulavin and his co-workers has revealed that Wip1-deficient animals also exhibit improved fat metabolism and cardiovascular health ("Wip1-Dependent Regulation of Autophagy, Obesity, and Atherosclerosis"). Lipid droplets, labeled with the dye ‘Oil red O’, accumulate in normal macrophages exposed to oxidated LDL (top) as they transform into artery-damaging foam cells. 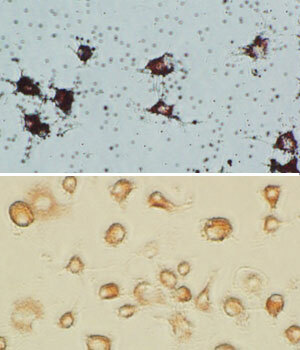 However, macrophages that lack the gene encoding Wip1 (bottom) rapidly eliminate cholesterol and show little lipid accumulation. Wip1 is a phosphatase, an enzyme that specializes in the targeted removal of phosphate chemical groups that modulate function of proteins such as Atm and p53. Both of these proteins regulate pathways that ameliorate potentially cancer-causing genetic damage, but have also been linked to cardiovascular health. To investigate whether Wip1 also regulates lipid processing, Bulavin’s team generated mice that were deficient in both Wip1 and apolipoprotein E (apoE), a protein involved in cholesterol trafficking. Mice without apoE are vulnerable to atherosclerosis, a narrowing and hardening of the arterial walls resulting from excessive accumulation of cholesterol-laden low-density lipoprotein (LDL) particles. Wip1-deficiency mitigated this effect, and mice lacking both proteins had lower body weight and greatly reduced tendency to develop atherosclerosis relative to mice lacking only apoE. The vascular damage associated with atherosclerosis is initiated when immune cells known as macrophages begin to consume oxidized LDL particles, and gradually transform into lipid-loaded ‘foam cells’. Bulavin and co-workers found that macrophages from Wip1-deficient mice are far more resistant to becoming foam cells, and that this transformation is dependent on Wip1-mediated inhibition of Atm. “Removal of just a single copy of the Atm gene resulted in a striking reversal of the suppression of obesity and atherosclerosis seen in Wip1-deficient mice,” says Bulavin. Closer investigation revealed that the actions of Wip1 on Atm cause macrophages to pump out cholesterol rather than hoard it. This requires the cells to physically liberate cholesterol molecules from lipid droplets; Wip1 promotes this by stimulating a mechanism called ‘autophagy’, wherein lipid droplets are absorbed into cellular compartments, known as lysosomes, and broken down enzymatically.